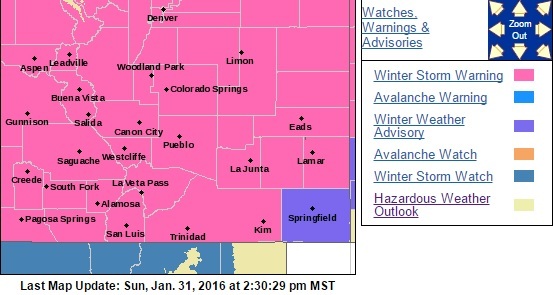 UCCS Alert: Effective 9:45pm Sunday January 31, 2016, the UCCS Campus is closed, due to inclement weather. February 1, 2016 closure remains in effect. This entry was posted in Uncategorized on January 31, 2016 by tstoeckl. UCCSAlert: UCCS is CLOSED for Monday, February 1, 2016 due to inclement weather. ALL classes & activities are CANCELLED. Any campus delays or closures throughout the period will be sent via UCCSAlerts, and can also be found on this page, at www.uccs.edu, or by calling the closure line at 719.255.3346. This Afternoon Snow. High near 30. Southeast wind around 10 mph. Chance of precipitation is 80%. Total daytime snow accumulation of 1 to 2 inches possible. Tonight Snow. Low around 19. Southeast wind 5 to 10 mph. Chance of precipitation is 90%. New snow accumulation of 2 to 4 inches possible. Monday Snow. The snow could be heavy at times. High near 24. East northeast wind 10 to 15 mph. Chance of precipitation is 90%. New snow accumulation of 3 to 7 inches possible. Monday Night Snow. The snow could be heavy at times. Low around 12. Wind chill values between -5 and 5. Blustery, with a north wind 15 to 20 mph, with gusts as high as 30 mph. Chance of precipitation is 80%. New snow accumulation of 1 to 3 inches possible. Tuesday A 40 percent chance of snow. Cloudy, with a high near 18. North wind 10 to 15 mph. 4:05pm – UCCSAlert: Attempted armed robbery occurred near Centennial Hall at 3:30p. Suspects not in custody, last seen westbound on campus. Suspects reported to be three black males. Vehicle is a newer Nissan Sentra, CO license QNP 533. Do not approach, call UCCSPD 255.3111 if seen. This entry was posted in Uncategorized on January 4, 2016 by tstoeckl.